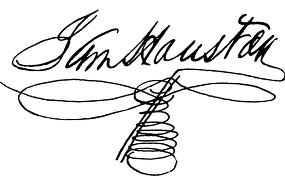 Many people may not know it, but there is a historical debate centered around Gen. Sam Houston’s signature. Brissette, along with members of the museum’s education department, will discuss the debatable implications of that, as well as show visitors how to make their own “mark” using quill pens and ink, on Thursday (Sept. 20). “Upstrokes, Downstrokes, and Curlicues: the Art of the Signature” will be from 4-6 p.m. at the Bear Bend Cabin, located on the museum grounds. “One of the things about handwriting and penmanship in general is that it changes and that there are distinctive styles. There is a British style of writing, a German style of writing, and an American style, too,” Brissette said. “The real heyday of American penmanship was 1850-1925. Following the Civil War, the Victorians became very interested in handwriting and signatures. There were schools and tutors to help men and women refine their penmanship. There was also some contention between different calligraphers. Since Sam Houston's day, a person's signature is less important than it was, with “signatures” being replaced by things such as an email signoff, a Facebook profile picture, or a PIN. “Our 'mark' has changed and evolved, but I think that the good old-fashioned, well-written signature will always be important,” Brissette said. “This event is more than just learning about writing well; it's actually practicing your own hand at signature writing with a quill pen you made yourself. It's more than just messing around with ink; it's exploring the art of inscribing your personality with a pen. The signature event is part of a new series of evening educational activities that will allow people to learn about various aspects of history after work. Other upcoming educational activities include “At Home in a Revolution,” on Oct. 4, which will focus on the Texas Revolution from “a new perspective;” a pumpkin carving contest, on Oct. 25; and “Harvest Festival in Eliza’s Kitchen,” on Nov. 8, which will allow people to assist in the process of and sample a 19th-century Texas meal using vegetables and herbs grown in the museum’s garden. “We believe we have a lot to offer here at the museum. We're wonderfully set up, with 15 acres of grounds, five historic buildings, the rotunda full of treasures and artifacts, and Sam Houston, unquestionably one of the most interesting Texans of all time,” Brisette said. “These educational events are a chance for us to pick something special about our site, or Sam Houston, or the time period and highlight it in a way which is interesting and fun. Donations of $3-5 are requested for the educational events in lieu of a set admission price for the events.